Specialty tattoos are safe and durable, perfect for your big upcoming event! Tattoos with special effects such as metallic, glitter, glow in the dark or have an invisible (premium) adhesive finish require a minimum order of 1,000. Instructions are printed on the back of your tattoos. StickerYou's Specialty Temporary Tattoos are waterproof, easy to apply, and will last up to 2-3 days without scrubbing. Should you wish to remove them immediately, the tattoos will come off with gentle scrubbing or baby oil. All temporary tattoos provided by StickerYou are non-toxic and safe to use. We recommend ordering in sizes above 2" x 2" in order to get the best effect. Minimum order quantity for these products is 1,000 pieces. Due to the delicate manufacturing process for these temporary tattoos, we cannot provide rush shipping. Specialty Temporary Tattoo finish options are listed below. 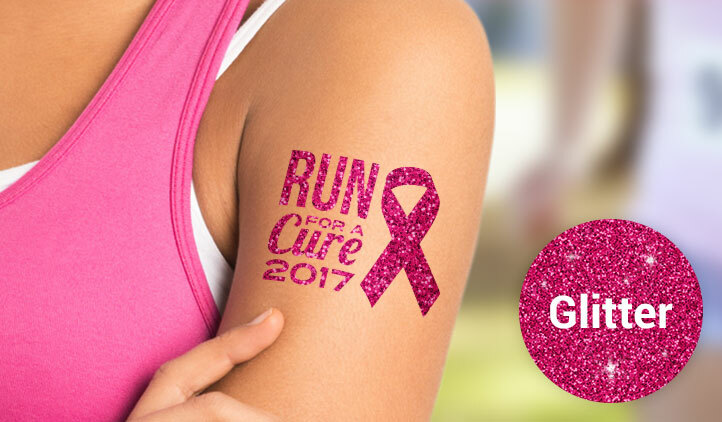 Custom glitter temporary tattoos are a great tool for promoting and event or giving away at a party. Whether it is for kids or adults, these sparkly temporary tattoos are a hit for everyone at any age. Glow-in-the-dark temporary tattoos can be a lot of fun! The glowing white ink shows up brilliantly in dark-lit areas, such as bars, clubs, festivals and outdoors at night. 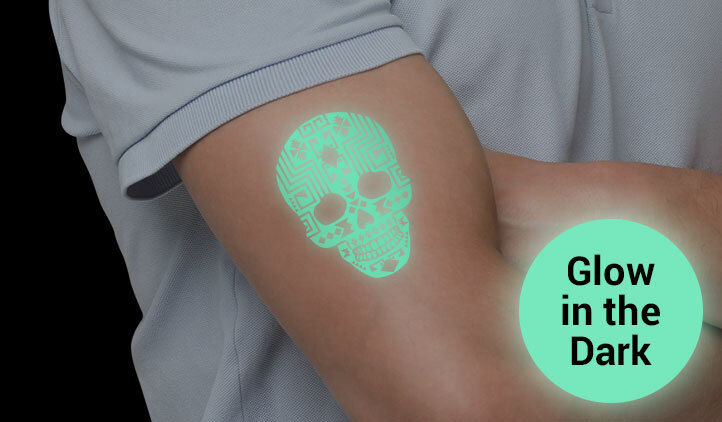 These glow-in-the-dark temporary tattoos are created with a special white ink that has phosphorescent particles that give of a glowing effect. These particles are only visible in white inks, so be sure your temporary tattoo design has lots of white areas to be sure you get a bright glowing effect. 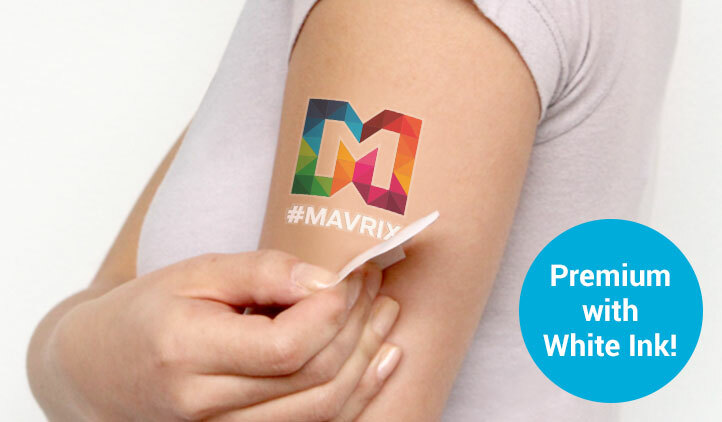 Premium temporary tattoos are ideal for your business or upcoming event. The adhesive finish is applied only to the area of your design, eliminating the need to cut around your design individually. They make a great promotional tool or swag product. If you’re ready to get inked this summer, StickerYou has endless temporary tattoo possibilities for all the events you’re attending. Here’s 5 events you’ve got to try temporary tattoos for this summer! This holiday season, we've been DIY-ing all sorts of things, including personalized tree ornaments. So now we are going to show you how you can create your own custom ornaments using plain bulbs and temporary tattoos! That's right, temporary tattoos. 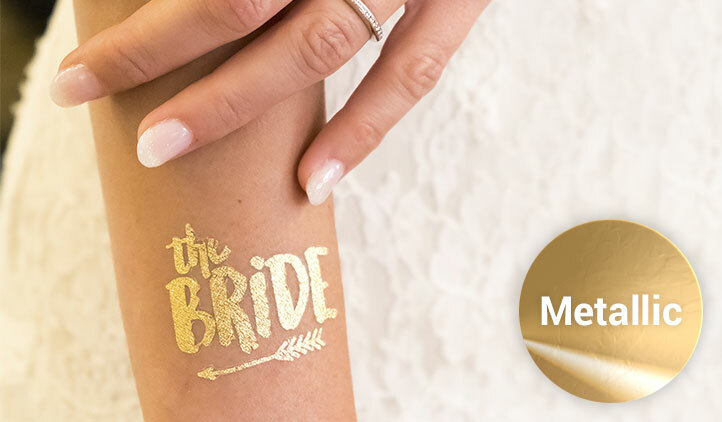 Step up your marketing game for your business or upcoming event with our brand new custom metallic, glitter, glow-in-the-dark, and premium specialty temporary tattoos! Top Wedding Temporary Tattoos-You Need to See!